Road trips can be trying on the best of travelers, let alone a young child. I don’t enjoy being confined to my seat for several hours at a time and I can imagine how frustrating it is for small children, especially when they are too young to gauge time and aren’t amused by the passing view. They just want to get to where you’re going! 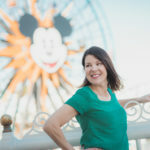 These road trip tips aren’t just about the journey or the car ride, but are helpful ideas for what to do at the stops along the way that will minimize meltdowns and frustration. 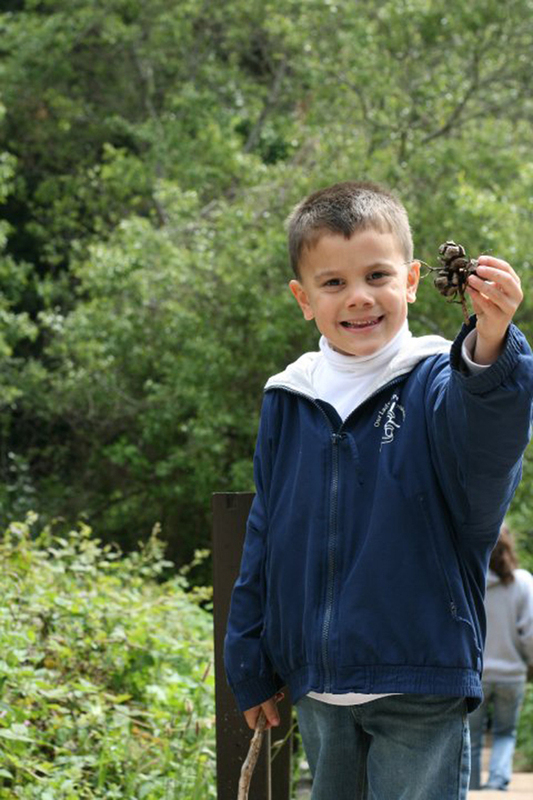 Several years ago my husband and I took our two kids (then both 6 years old) on a road trip up the coast of California. 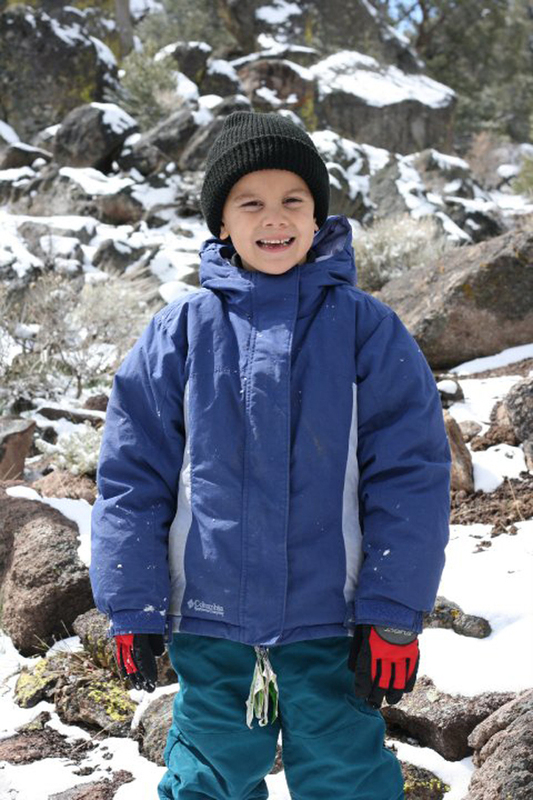 It was a week-long adventure that included stops for an Easter egg hunt in Pismo Beach, a hike through Big Sur, a day at the Monterey Bay Aquarium and a visit to family in snowy Reno, Nevada. We would be in the car for several hours at a time and had scheduled plenty of stops along the way for the kids to get out and stretch their legs. What we didn’t bargain for was the challenge of taking a special needs child. While both children chatted in the backseat, snacked, played with toys we’d brought along and napped while the car was moving, it was the in-between transitions that we had the most trouble with. The disruption to the usual routine, the unfamiliar foods and the strange places and faces are what really threw off my stepdaughter (who has autism). Each stop along the way brought trepidation and tears and looking back. I was see there were things we could have done to make the trip so much smoother. So here are my top eight tips for road tripping with young kids (especially helpful with special needs children). This was our number one mistake. At the time we thought it would be fun to make the trip a surprise and boy,did that bite us! Because the kids had no advanced idea what we were doing, where we were going and when we were doing things, they were nervous at each stop. Even though we were doing fun and exciting things that were age appropriate (An ocean-side Easter egg hunt! Exploring at an aquarium! ), they didn’t know what to expect and as a result, dug in their heels each time we arrived. Knowing what we know now, we should have been planning the trip with them and letting them know weeks ahead of time what we’d been doing at each stop. This definitely would have alleviated any fears about simply getting out of the car. Giving kids a make-shift road map (even something simple that you draw up yourself) can help them feel like they are a bit more in control and can relax instead of stress out about the new locations. Now we know that we need to carefully watch the time and make movements about an hour early to get our group towards the exit. Letting kids know, “We’re going to be leaving soon” and offering the next step (“We’re going to have lunch after this”) helps them transition. It’s a slower and more gradual shift than an abrupt, “We have to go NOW”. Sitting for hours at a time is uncomfortable. 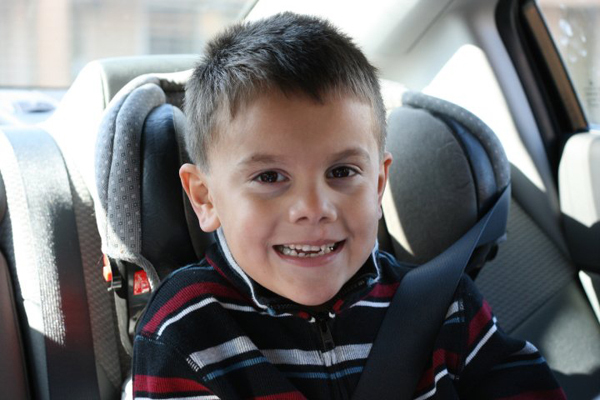 Make sure kids have car seats and booster seats that are properly secured and comfortable to sit in for long periods. Consider purchasing a seat belt cover that’s padded or has a built-in pillow to rest their heads on as they nap so the belt doesn’t rub into their necks. Even bringing along a small blanket from home can help a child relax on a long drive if they have something familiar to snuggle with in the back seat. Books, colored pencils and blank drawing books and small action figures successfully entertained our young kids on the road. Our daughter was fascinated by a plastic wand filled with colored water and sparkles that she turned back and forth for hours during that trip. Bring along whatever things you feel might cure boredom. To keep things fresh, I packed entertainment items in a duffle bag and pulled them out one at a time along the way rather than giving the kids everything all at once. We didn’t have electronics on our road trip but if you have them, bring them and use them sparingly. Try to fill the long stretches with family-friendly games that are classic favorites like I Spy. Radio and cell reception can be spotty on the road so if your car has a CD player, borrow discs of music or stories from the library that the kids would enjoy. And if all else fails, you’ll have the electronics to fall back on. Kids thrive on routine (especially kids with special needs) so do your best to keep to the usual. Obviously this can be a challenge especially when kids fall asleep in the car or you aren’t arriving to your location until very late. This can throw off their normal bedtime and make for some cranky moods. Plan meal stops at regular times to keep mood levels consistent. Consider driving some of the way at night so kids are falling asleep at a decent time and you can carry them in to their hotel bed. No doubt about it, nibbling in the car is a great way to pass the time. Make sure you are choosing snacks that are filling and well-balanced to fill their tummies and not just to fill the time. We kept a small soft-sided cooler in the car loaded with small snacks and bottles of water to hand out through the day. Nuts, cheese, fresh and dried fruit and dry cereal are easy to transport and eat while you’re driving. Keep candy, soda and sugary-snacks as a special treat or to use as a bribe to get kids into the car. Sometimes you have to do whatever it takes! Long sits in the car require more than just a simple road-side stretch of the legs. Kids need to burn off their excess energy so scout out locations ahead of time like parks or open spaces on your route where you can stop for a bit and allow them to play. In case there is no playground, bring a jump rope, bubbles or an inflatable beach ball to toss and kick around. 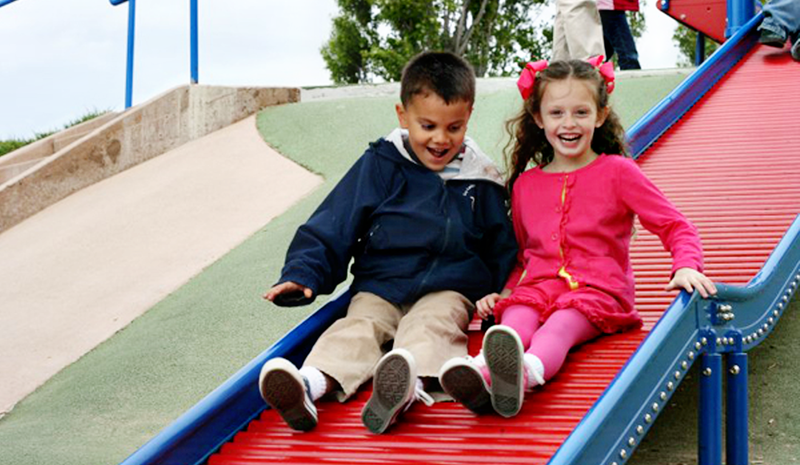 When we visited Monterey Bay, I found this amazing park (Dennis the Menace Park) and we let the kids play for an hour before we hit the road again. Being able to play did wonders for them and when they finally climbed back into their seats, they were much more relaxed and eager for the next adventure. Even with the best of plans and the most heartfelt of intentions, sometimes kids just have a difficult time on the road. It’s important to just “go with the flow” and do the best you can in that situation. Depending upon their age and disposition, you may need to plan extra breaks (especially for babies or toddlers who will need their diapers changed). 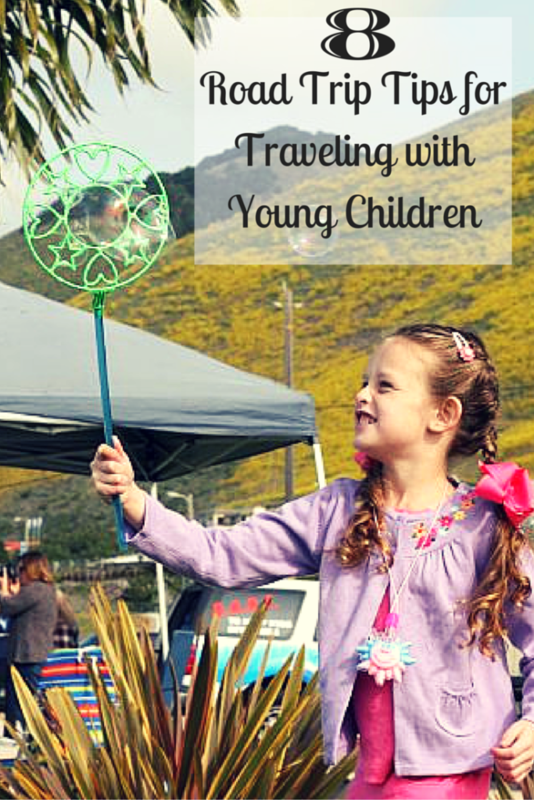 Take your cues from your kids on your road trip and plan in extra stops if necessary. Things don’t always go as planned on the road what with traffic, car trouble and the like. You want to be sure that your mood isn’t rubbing off on the kids. Adults should take turns driving so that the other can take a break, eat a snack or nap. Don’t be thrown off by your kid’s tantrum or a meltdown and the impending stares you might receive from others around you. A simple “We’re on vacation” should explain and shut down any comments…other parents will understand! Do you have any road trip tricks that I missed? Share them with me in the comments!